On a Clear Day by Alex Meurice. In 1967, seemingly once and for all, Agnes Martin abandoned painting, left New York, bought a trailer and moved to the New Mexican desert. After four, solitary years on the mesa, Martin was invited by Luitpold Domberger – a master screenprinter renowned for collaborating with Josef Albers, Max Bill and Victor Vasarely, to execute a series of screenprints. Titled On a Clear Day, this austere achromatic work develops the grammar of linear divisions which Martin would use for the rest of her life. Inspired to paint for the first time in many years, Martin relinquished the browns and greys of her earlier work for luminous and joyful pastels. In a note from 1975, she wrote: Art work that is completely abstract – free from any expression of the environment is like music and can be responded to in the same way. Our response to line and tone and color is the same as our response to sounds. And like music abstract art is thematic. It holds meaning for us that is beyond expression in words. These prints express innocence of mind. If you can go with them and hold your mind as empty and tranquil as they are and recognize your feelings at the same time you will realize your full response to this work. * If the meaning of abstraction lies beyond words, here we can only write circumstantially, of abstraction’s materials, processes, influences and origins. From Centre would not have been possible without the recent success of Saturation Point, the online editorial and curatorial * Agnes Martin, ‘Comment About the Prints: On A Clear Day’, 19 October, 1975. 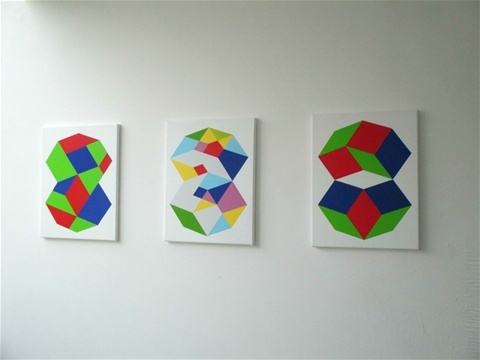 6 7 project founded by Hanz Hancock and Patrick Morrissey in 2011, in bringing together the principal reductive, geometric and systems artists working in the UK today. As a result, the exhibition includes artists born in every decade from the 1930s to the 1980s, a number of whom are linked through pedagogy, matrimony and friendship. Notably, Tess Jaray counts Richard Plank, Nathan Cohen and Rana Begum among her students during her thirty years at the Slade, and Peter Lowe mentored Patrick Morrissey and Steve Sproates at Goldsmiths. A student of the late Kenneth Martin himself, Peter Lowe belonged to the Systems Group, whose influence is seen in many of the works exhibited here, and whose principal members included Malcolm Hughes, Jeffrey Steele, Michael Kidner and Jean Spencer. The Systems Group artists sought to abandon the utopianism of earlier constructivists, and built complex spatial compositions from simple geometrical elements by applying rules derived from mathematics. Mathematics is essentially an attempt to create order in a chaotic world, and the strict rational aesthetic of the Systems Group thus provides a foundation for art to address deeper, less visible realities, patterns of the world and of the mind. In their essays published here, Nathan Cohen and Laura Davidson hint at multiple sources and contexts for contemporary geometric abstraction, from the infinite horizon of algorithms to backstrap weaving and neurology. The twentythree artists exhibited in From Centre are prolific in exploiting these new possibilities for reductive geometry, at times architectonic, hieratic, kinetic, mosaic, poetic, nostalgic or ironic. This plethora of attitudes, materials and processes avoids any narrative or imagistic content to locate meaning beyond verbal description. Agnes Martin’s advice, to ‘go with’ the innocence of her prints, can help us to perceive how these works have aligned thought, feeling and imagination through abstraction. This exhibition would not have been possible without the generous time and help of numerous individuals, above all the artists exhibited. I especially would like to thank Patrick Morrissey, Hanz Hancock and Charley Peters from Saturation Point for proposing to collaborate on this exhibition and for their devotion to reductive art and artists. Thanks also to Emma Hill of Eagle Gallery, and to Domo Baal, who represent several of the artists exhibited. Thank you to Stephen Barrett for designing this publication, to Nathan Cohen and Laura Davidson for writing their essays on such short notice, to Damian Griffiths for photography and to Martin Church for his technical assistance. Last but not least, a heartfelt thanks to our kind landlords for providing this magnificent space.